As East Coasters prepared to hunker down for a supposedly historic blizzard, locals in search of a cuddle partner flocked to mobile dating app Hinge. The service, which connects people based on mutual social connections and physical location, experienced a surge in usage on Monday. Karen Fein, director of marketing at Hinge, told HuffPost via email that before the snow started falling, Monday had been a typical day for the app. But around 3 p.m., once the wintry weather had descended and many young professionals began making their way home, people started signing on in droves. Fein said Hinge experienced an average of 4.75 logins per user on Monday -- a record for the app. "User sessions" -- the number of times an individual logs into the app -- spiked by 27 percent during peak hours. Activity on the app increased by 22 percent overall on Monday. Fein declined to disclose the average number of logins for a normal day, or the number of people these percentages translate to. These data points are limited to the app's East Coast users; the vertical axis measures the number of sessions. The chart looks at data from Monday, which it calls a "pre-snow day," since the storm was expected to shut down many areas of the Northeast on Tuesday. 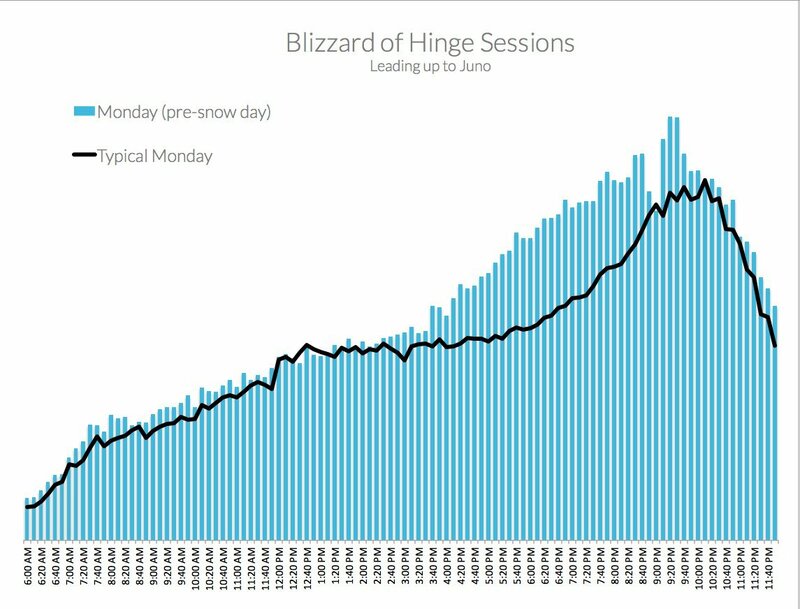 The 27 percent lift in Hinge sessions began around 3 p.m. and fell off around 10 p.m., when usage typically starts winding down, according to Fein. "Most of our users are young professionals and knew work would be closed [Tuesday]," said Fein. "Who wouldn't want a playdate on a snow day?" Used in 29 cities nationwide, Hinge is a mobile dating app that introduces people to friends of friends through Facebook. The app curates daily potential matches based on interactions with past Hinge connections. According to figures provided by the company, 99 percent of users are college-educated, and their most popular industries include banking, consulting, media and fashion. CORRECTION: Language has been changed to differentiate between activity during peak hours and overall activity on Monday. Kerry Flynn is a former fellow with HuffPost Tech.